Ever since I have lived in China, I have been looking for an "easy" way to transfer money from China to the US. I also have been looking for a way to do this without paying excessive transfer fees, conversion fees, or withdrawal fees. This month, I found out how. Not only am I not paying fees, but I ended up having about $600 MORE just by transferring the money. Buy Bitcoin in the country you would like to transfer from when the market is at least about 1.5% lower than in the Bitcoin market you want to transfer to. Transfer your Bitcoin from the market where you purchased it to your destination market. Sell your Bitcoin and deposit it into the bank. OK. If that does not make much sense or if you would like to read a detailed explanation and see an actual transaction that I made, please keep reading. Note:While I am giving examples for specific banks (ICBC and Capital One), countries (China to US), and Bitcoin markets (BTCChina and Coinbase), the principles are the same with other countries, markets, and banks, and can be used in variation. First things first. The mandatory Bitcoin warning. If you don't know what Bitcoin is, you should do some research before you attempt any of what I am about to tell you. You can read up on it from their official webpage, or from its Wikipedia article. Here is the warning: Bitcoin is new and not FDIC insured and the price fluctuates like crazy. If you buy Bitcoin, you are taking a risk. I will show you how to limit and almost eliminate all risk, but there is still risk involved. If you cannot risk losing any money, this is probably not the best option for you. Also; transferring money using this method depends on specific factors. These factors may not happen all the time (or ever) so if you need to make an immediate transfer and cannot afford to lose any money, again; you may want to look elsewhere. The reason for doing this is not because you will buy Bitcoin right away, but so that money is in the account so that you CAN buy Bitcoin immediately when the market conditions are right. BTCChina is one of the largest Bitcoin markets in China and in the world. There are a few other options but I would recommend this one as they provide a simple way of funding the account and they have an English version of their website. 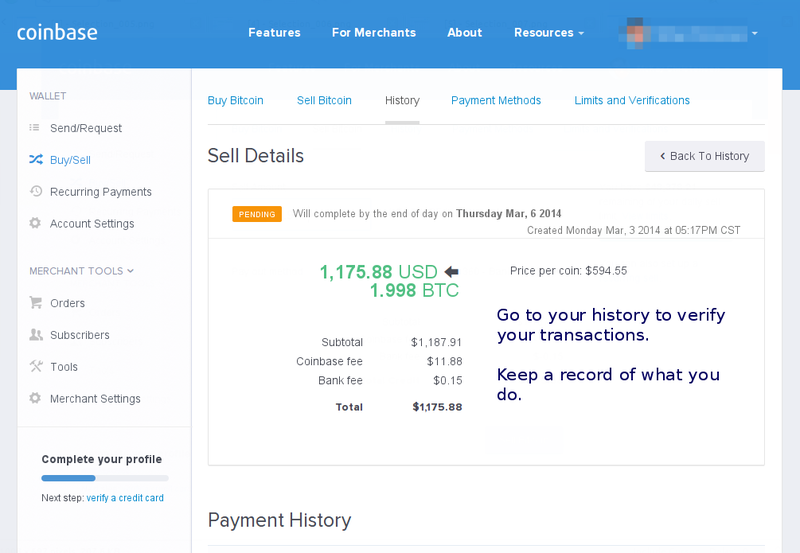 UPDATE (2015-07-09): BTCChina has been charging fees, so I have started using OKcoin instead. I will get into this step in more detail later on, but basically, if you want to make instant transfers and assure yourself that you won't lose any money (on that specific transfer), you must already have some Bitcoin in your account. After you have purchased your Bitcoin, you will need to transfer this to your Coinbase account (again, more details below). To make money transferring Bitcoin, you must buy when the Chinese BTCChina market is lower than the US Coinbase market. You can do this by going to their websites and checking the markets constantly, or you can set up your phone to do the same thing. 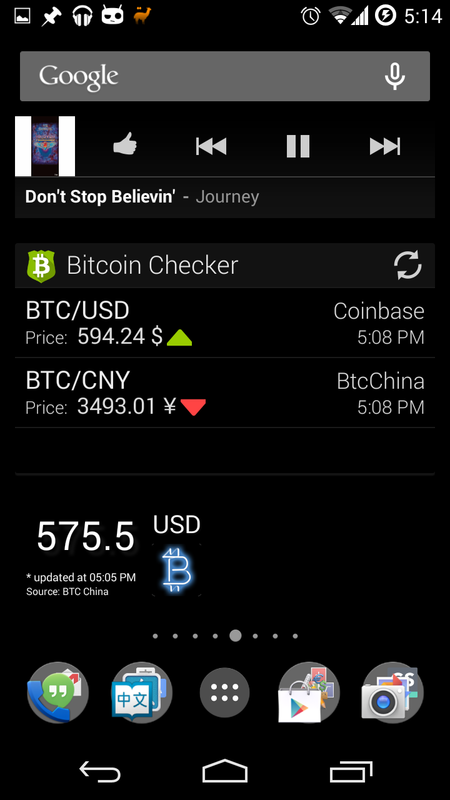 On my Android smartphone, I installed the widget Bitcoin Checker. I like this widget because it allows me to check the BTCChina market and the Coinbase market together. As you can see in the screenshot above, the Coinbase market is going up while the BTCChina market is going down. This is good. This is what I want. This means I can buy low and sell high. Sadly, the Bitcoin Checker app does not convert RMB to USD so I had to install an additional widget called Bitcoin Price Index Widget. This widget is nice because it converts the BTCChina RMB to USD for me. As you can see from my screenshot, the current USD price for Coinbase is $594.24 while the BTCChina price in USD is $575.50. This means that if I were to buy at BTCChina and sell at Coinbase, I would make almost $20. Obviously it is not that simple. Both BTCChina and Coinbase has (very small) transaction fees. Coinbase also has a 1% for converting your money before you deposit it in your bank. That means if you don't want to lose money, the Coinbase market price must be at least 1% higher than the BTCChina market price. When the screenshot was taken, the conditions were just right for making the transaction; so I did. (Note: by time I had actually made the transaction, the market had shifted a bit. The Bitcoin market is constantly changing so the higher above 1% the better). I took screenshots of the whole process so you can see exactly what I did. I also kept a spreadsheet of all my transactions so that I could later verify that I did not lose money. For this transaction, I wanted to buy 2 Bitcoins. I already funded my account (Step 1) so I simply input 2 (in the market, not "limit") and bought my 2 Bitcoins. Coinbase is a US Bitcoin wallet. Coinbase allows you to sell your Bitcoin and deposit it into a US bank. 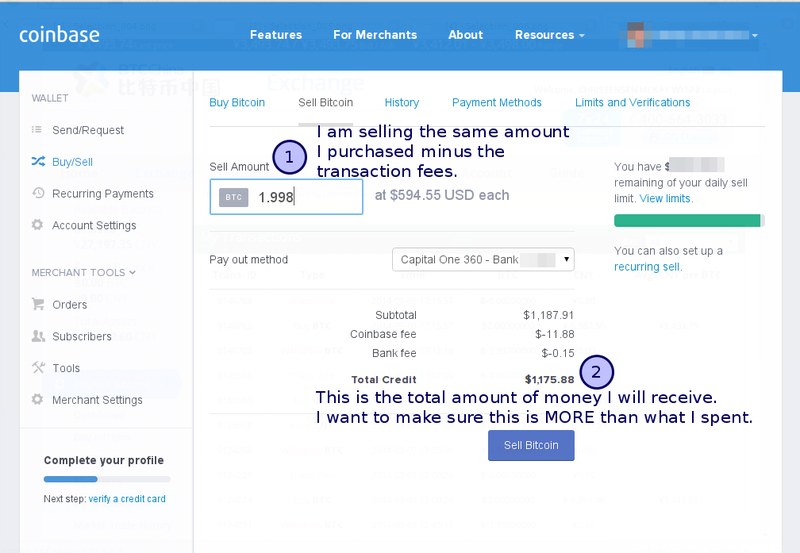 Before you make any Bitcoin purchases or transactions, you will want to make sure that you have your bank account information setup in Coinbase. Before you sell your Bitcoin, you will want to make sure that you are actually making more money than you spent. If it is not, the conditions were probably not right for you to purchase... no worries though, if you have faith that the market will go up, you can hold onto your Bitcoin and sell it when you will make more profit (likewise, Bitcoin could crash and burn and you could lose your money). Steps 5,6 and 7 can be interchanged or combined depending on how cautious you want to be on the transaction. 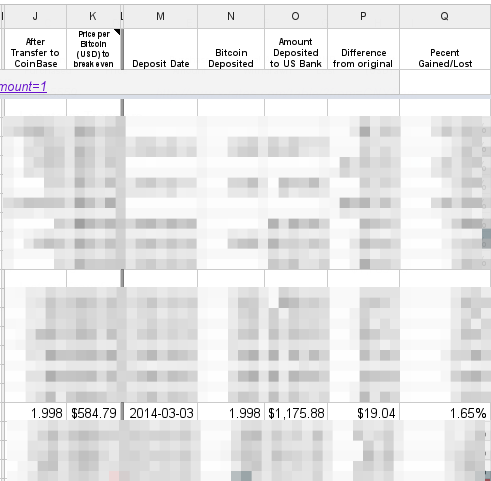 I generally input everything into a spreadsheet as I am doing things so I can make sure that I will make money on the transaction. This whole process only takes me about 1-3 minutes. Both BTCChina and Coinbase show detailed history of transactions. I use this information to see exactly how much money I spent and how much Bitcoin I actually bought and have after all the transaction fees have been included. I input all this information in a spreadsheet. In the screenshot above you can see my transaction history in BTCChina. In the screenshot below you can see the transaction for Coinbase. Finally, after I have made my sell finalized, I like to check and verify the actual amount. At some point we need to transfer our Bitcoin from BTCChina to Coinbase. If you already have Bitcoin in your Coinbase account (Step 2) you can transfer before or after you sell on Coinbase (up to the amount of Bitcoin you already have in your Coinbase account). If you did not complete step 2, then you will want to transfer the Bitcoin immediately after you have purchased it. I find that it usually takes 30 minutes to two hours for the transfer to be complete. 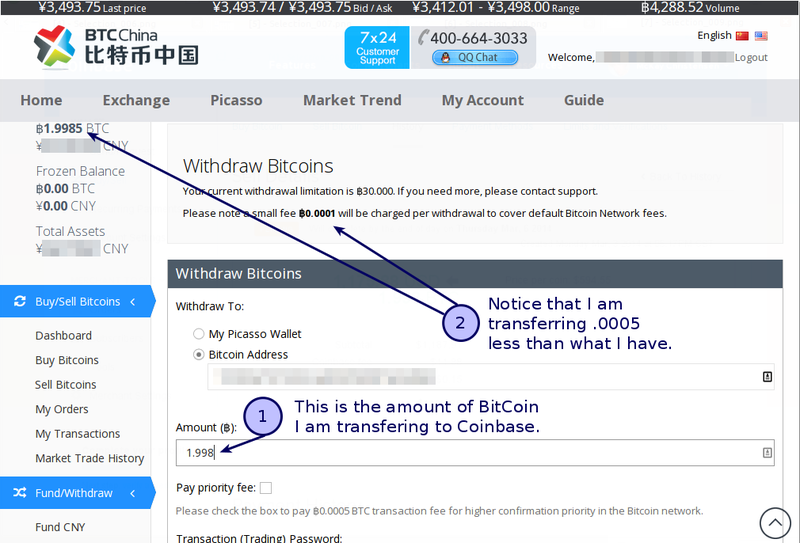 To transfer your Bitcoin in BTCChina, you will select the "Withdraw" option and input your Coinbase wallet address. 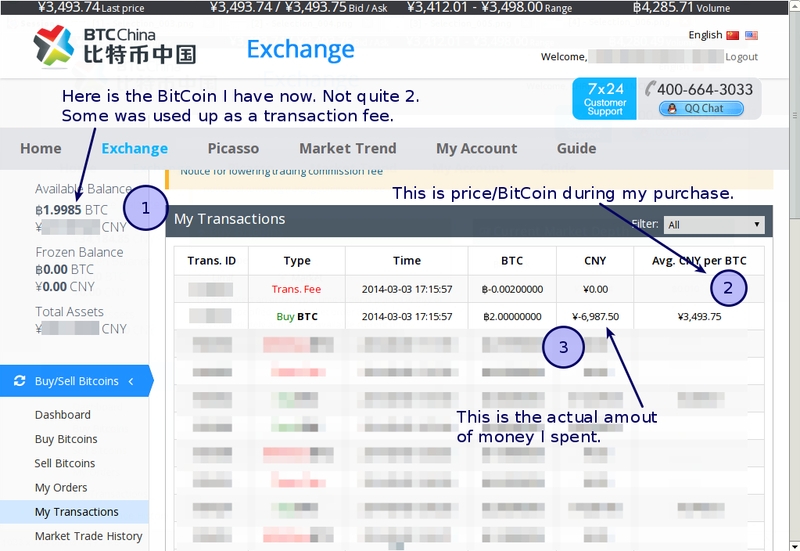 Keep in mind that when you transfer, BTCChina has a fee of .0001 Bitcoin, so you cannot transfer ALL your Bitcoin (you can transfer almost all of it though). You might have your own method for keeping track of all your transactions. I prefer to use a spreadsheet. 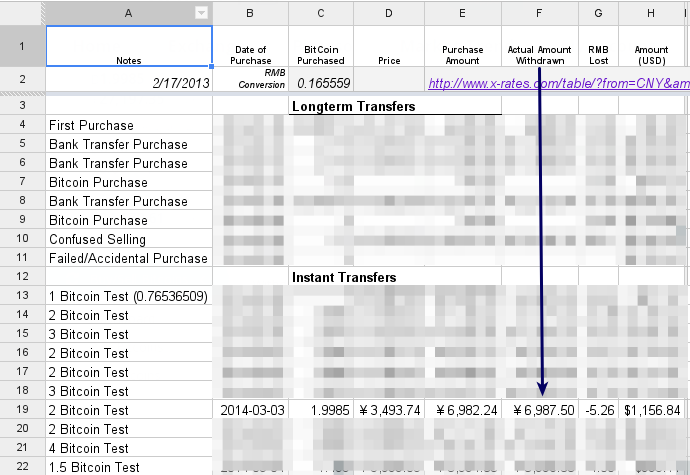 Everything that involves numbers (RMB, USD, Bitcoin, etc) I keep track of in my spreadsheet. I even have a conversion rate for RMB to USD so I am make sure that I will be making money on my transactions. 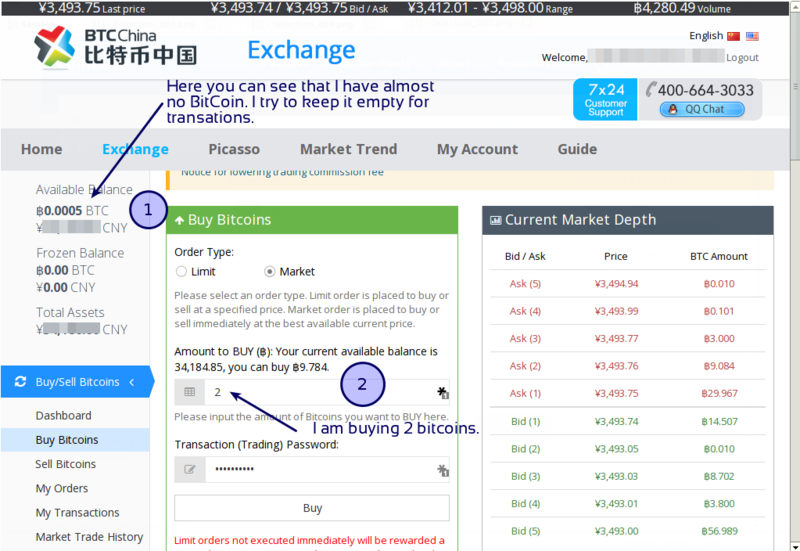 On the screenshot below, I have pointed out the actual amount of money in RMB I spent on the Bitcoin. The screenshot below shows the actual amount of money that was deposited into my US bank account. I must admit that when I bought my first Bitcoin I was rather nervous. I was even more nervous when the price promptly dropped a couple hundred dollars per Bitcoin. I endured however and have tried to be as smart and careful as possible and happy that the market did eventually climb back up and that I was able to make transactions when the market was good. If you look at the screenshot in step 6, you will notice that I spent 6987.5 RMB. A simple Google search (above) shows that the conversion for that comes out to be about 1135 USD. From the Coinbase transaction that I made (in step 6) you can see that I deposited about 1175 USD in my back. Simple math would say that I ended up with $40 more than I started with. Forty dollars may not seem like a lot for a thousand dollar transaction, but if you consider the fact that you would normally pay 3-5% for a similar transaction using another method, I would say it is pretty amazing. I have come to realize there are a few different schools of thought when transferring money using Bitcoin. I will mention these briefly. This would be buying Bitcoin when the market is low and sitting on it while you wait for the market to go up significantly. This would be like a long term investment expecting Bitcoin to continue to go up in price. Pro - This has the potential to make you a LOT of money (if Bitcoin continues to go up in price). Con - This has the potential of you losing a lot (or all) of your money. This would be where you buy from BTCChina when the conditions are good; immediately transfer your Bitcoin to Coinbase, then sell it as soon as it arrives. Pro - This does not require you to already have Bitcoin in your Coinbase account. If the conditions are good, you can make decent money. If the market goes up in the 30 minutes to 2 hours while the Bitcoin is transferring, you can potentially make even more money. Con - While the risk is low, it is still there. If the market goes down immediately after you purchase Bitcoin, you will stand to lose money when you sell it at Coinbase. This also requires you to sit at your computer for a couple hours, waiting for your Bitcoin to transfer. This is the transaction I focussed on in this post. This is the most common transaction I made. This type of transaction requires an initial Long term transfer (investment in Bitcoin). For this transaction, you will buy from BTCChina (the amount of Bitcoin you already have in Coinbase) when the market diffence is good and immediately sell it in Coinbase after you have purchased it. You will then transfer the Bitcoin after selling, thus replenishing your supply and continuing with the same amount of Bitcoin you started with. Pro - If you wait for the right conditions using this method, you can guarantee yourself to make money on a transaction basis. Con - This method requires an initial purchase of Bitcoin. It also offers no risk/no reward, besides the current difference in BTCChina and Coinbase markets. Which school of thought is best? I think a combination of these types of transfers is the best. It really depends on what you are going for (breaking even or making serious money). I have been able to work it out where I transfer just the right amount of money to break even, then leave the remaining Bitcoin in my account. I am now to the point where I almost have 1 Bitcoin that is leftover from previous transactions. That means I can make future transactions and guarantee that I will NEVER lose more money than I spent on Bitcoin. Pretty cool stuff. Are you still using "yijingdong" to buy the vouchers? I tried today and it didn't work for me. Hey Dan; I have not done much with Bitcoin recently because the market has not been that great (and because I have already transferred most of my money), but it would appear that you are right. Yijindong is not longer up. Definitely a pity because that was BY FAR the simplest and fastest way to fund CNY. It looks like bank transfer is back though (bank transfer seems to come and go quite regularly). I have done bank transfer in the past and it is not too bad. You just have to wait longer and it is a bit more hassle (not to mention a [small] fee). Let's hope yijingdong comes back soon. I'm also having trouble funding the account using Yijingdong and I don't see a bank transfer method either....it seems the only other option is to use one of those companies selling vouchers on Taobao/QQ, which means remitting money to their account first. Do you know if they can be trusted and if this is a safe method? I did it once using Taobao, and it worked just fine, but I will admit that the whole process made me quite nervous. My suggestion would be to look for a seller with a high rank, and who has a lot of positive comments on their page. Also, if you can find one that speaks English, that would definitely be a plus. I also think it would be wise to start out without transferring a lot of money until you can get comfortable with the seller. Just used the hour-long transfer method. It looked like the market was a little in my favor, but it was just a stale widget on my phone (won't make that mistake again). Regardless, it cost less than transferring using PayPal and it was fun getting my feet wet in the bitcoin pool! Thanks for your comments Kevin. Glad both Paypal and Bitcoing worked for you. Bitcoin is quite fun but nerve racking nonetheless. Hopefully as interest continues, the Bitcoin value will slowly climb. I have some long term investments in it right now and would love to see a significant increase! Thanks a lot for a awesome presentation on and lot of online It Support. In theory, this still all works. The market is a bit different now from when I wrote this. The market now is comparatively lower and also more stable. This means that short term trading is not a very good idea. At the same time, if you do a long term investment and the market goes back up again, you can make a good chunk of change. Also, in China, it is now a lot more difficult/bothersome to purchase Bitcoin. China does not like people using anything buy RMB. Hi, This is an open secret to make money from online. Just a few minutes for away here and make money with an easy way. This can be a short study on a number of your particular perceptions along with preferences and may take only 5 minuets to try and do. So enjoy this for making money. Nice topics & article posted on blog. I like these tips. This is great and important elements in the modern world that mean how to make money . I have always wanted to know where all the yummy Vegan places were and now i can easily eat out at these place or order in! thanks so much! Can this method circumvent the 50k dollar cap on moving money overseas? Great guide! But I tried to get an account today with BTCChina, but they are temporarily unable to assist American citizens as they process their licenses in compliance with the U.S. Government. In the mean time, I've found another simple way to purchase Bitcoin through wechat wallet and I'm going to write a post about it on my blog. Some of the information in this guide is so great that I might link to/refer back it. Thanks for the tutorial. I had no idea you could buy through WeChat wallet. That is a good suggestion. I look forward to your blog post! Thanks for great article! I thought about this way of trading myself when noticed that btc-e is nearly 15% lower than btcchina. But the problem is that when buying btc-e, I'm loosing approx. 7% of money, and, besides, I don't know how can I withdraw from btcchina, cause I live in Armenia. I think only if they have wire transfer with good fees. I think about making this a constant way of earning, but first I have to do research about different market's depositing and withdrawal fees and methods. But wondering, will they process withdrawal requests from the same account for every few days? Thanks! This article is really helpful - I'm an American teaching in English in China and have been trying to find a way to transfer money. I'm running into an issue, though - neither BTCC nor OKCoin allows Americans to deposit bitcoins anymore. Do you know of any other bitcoin sites I could use? Thank you! Hi there, you can use Russian btc-e.com. You can use okpay.com to deposit/withdraw to/from it after comleting verification, or use yandex.money I think again after verification in it or another methods, and you have to change yandex.money or okpay.com or another e-currency to btc-e code, so that way you buy bitcoin in btc-e.com and withdraw. You have to search for exchange services on bestchange.com monitoring service. Just search for tutorials about using btc-e on youtube on english or elsewhere.If you need more assistance reply to my comment. Great post. Really helpful. But does this kind of transfer requires to pay any kind of taxes to the countries (China or USA)? I am moving from Brazil to Spain and I am considering the possibility to transfer my money through bitcoins (and this method), but I am concerned if I could get any trouble with the countries laws. Great way to earn money! Can you let me know of any tax implications on the income you would make? How do you report it in US?